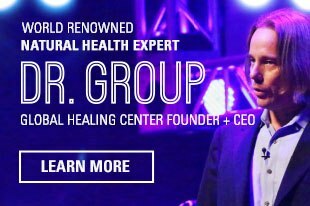 Iodine is a naturally occurring element necessary for human growth and metabolic function. Its chemical symbol is I and its atomic number of 53 on the Periodic Table of Elements makes it one of the rarer earth elements necessary for life. Most of the earth's iodine can be found in the oceans. In nature, iodine exists as elemental iodine or as an iodide. Elemental iodine is two iodine atoms bonded together. 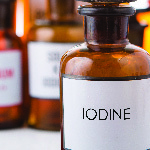 In this form, iodine should never be ingested or applied directly to skin or tissue. It is highly corrosive and will cause severe damage to tissue on contact. Although, unless you're in a laboratory setting, it's unlikely you're going to come in contact with elemental iodine. Iodide is the ion state of iodine, occurring when iodine bonds with another element, such as potassium. In this form, iodine can be ingested or applied topically (such as with povidone iodine, an iodide). Dietary iodine also occurs naturally as an iodide, such as potassium iodide or sodium iodide (the kind typically placed into salt). When you purchase iodine from the local drug store, it's usually an iodide solution. 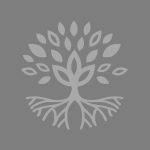 This combination allows the body to absorb and use it safely. 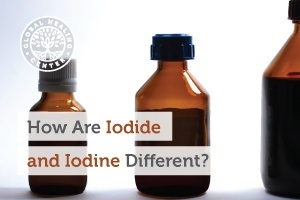 So iodine and iodide are simply different expressions of the same element. Iodides simply represent a safe form of iodine for ingestion. Iodides do have the drawback of requiring additional energy from the body to break the iodide bond to use the iodine. 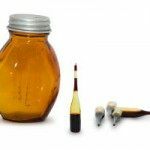 In an effort to provide a more pure form of iodine, atomic (or nascent) iodine has been developed. 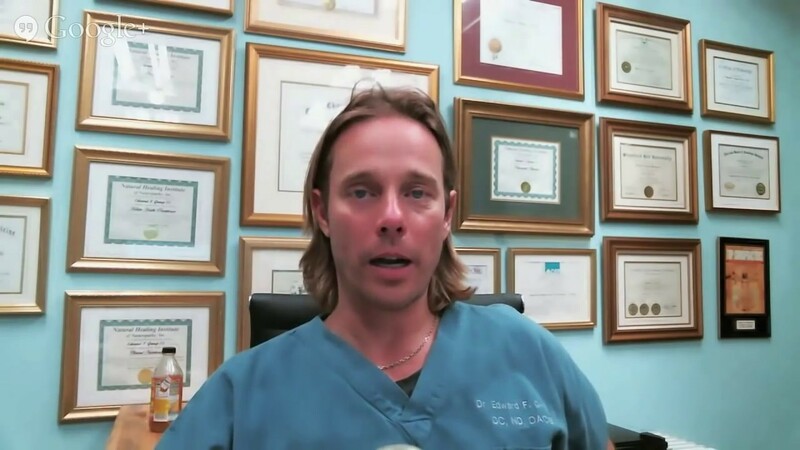 In fact, Global Healing Center's product Detoxadine® consists of this type of iodine. This form of iodine contains a single iodine atom, which does not cause severe damage to tissue. In fact, it provides the body with an easily absorbable and available form of iodine. Proper human development and metabolic function requires iodine. 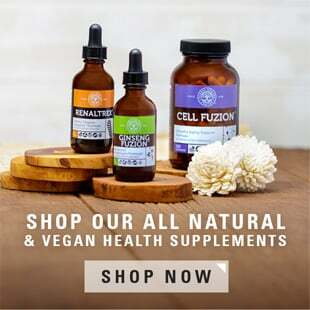 It combines with tyrosine, an amino acid, to form two of the most important thyroid hormones that regulate metabolism, thyroxine (T4) and triiodothyronine (T3). Too little iodine during fetal development and childhood can cause developmental problems. Studies have found a lack of iodine leads to reduced mental development and lower IQ. Functional imbalance results from too much or too little iodine and lead to long-term problems such as hypothyroidism and hyperthyroidism. Without proper iodine consumption, the human body simply doesn't work normally. Iodides occurs naturally in food derived from the ocean. 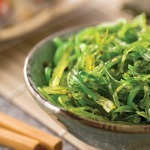 Fish and seaweed, for example, contain nutritional sources of iodine. Unfortunately, because iodine bonds so easily with water, very little exists in the earth's crust which means land based foods contain little iodine. That's why so many countries have iodized salt, to ensure that individuals can get enough iodine in their diets. Iodine exists in a variety of supplements. For persons who are iodine deficient, atomic iodine may be an option for increasing iodine levels naturally. McNeil, Donald G. Jr. "In Raising the World’s I.Q., the Secret’s in the Salt". New York Times (2006-12-16). Pearce EN, Andersson M, Zimmermann MB. Global iodine nutrition: where do we stand in 2013? Thyroid. 2013 May;23(5):523-8. doi: 10.1089/thy.2013.0128. Epub 2013 Apr 18.